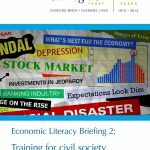 This briefing looks at economic literacy training undertaken by civil society leaders, following research commissioned by the Trust. The research found that for civil society leaders that require some level of economic literacy, their understanding of macroeconomics needs to improve in order for them to be fully effective in policy circles. However, it questioned whether such training would be considered a priority in a sector with fewer financial resources. Please click here for the briefing on economic literacy training undertaken by UK-based journalists.